Apple's mobile processor manufacturer, TSMC, has reportedly entered into production of 10-nanometer chips for this year's upcoming iPhones. Efforts were initially hampered by problems "stacking components in the backend integrated fan-out packaging process," but those have already been solved, DigiTimes sources said on Thursday. The people didn't supply any other details, such as Apple's intended launch window. The claim echoes other recent reports, however, suggesting that TSMC and other Apple suppliers are gearing up for the OLED-based "iPhone 8,", which could ship as soon as October, on or slightly after the launch of two LCD-based "iPhone 7s" models. TSMC in particular may enter mass production on June 10, delivering "A11" processors in bulk to Apple assembly partner Foxconn by the second half of July. Foxconn and Apple's two other assemblers, Pegatron and Wistron, are thought be in the middle of hiring surges needed to meet iPhone demand. KGI analyst Ming-Chi Kuo recently claimed that full-scale "iPhone 8" production might start as late as October or November, which would result in "severe" shortages for potential buyers. This could be a result of manufacturing issues with Samsung's OLED panels, and/or trouble merging a Touch ID sensor into the phone's display. 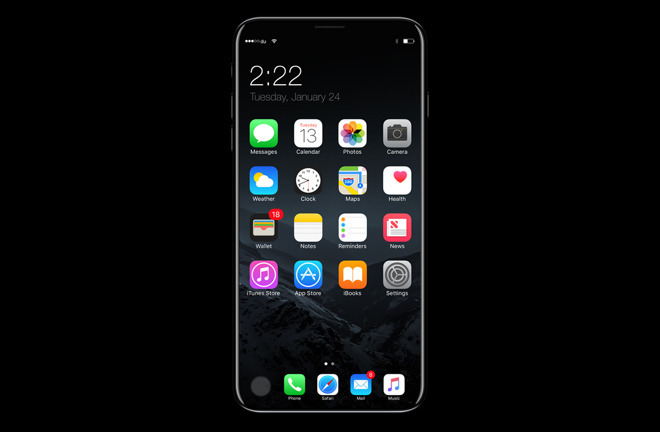 The "iPhone 8" is expected to feature an edge-to-edge, 5.8-inch OLED screen, replacing a physical home button with a virtual one. It should also sport wireless charging, faster cable charging, and 3D facial recognition and/or iris scanning. "7s" devices should sport 4.7- and 5.5-inch LCD screens, but still include some features of the "8," such as the charging upgrades and "A11" processors.